How can I not love a place with “butter” in its name? 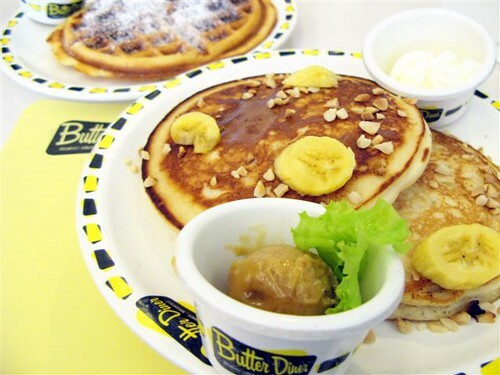 In addition, how can I not love something called Butter Diner? It’s a “greasy spoon” of a place that embodies everything great about the diner: generous amounts of a wide variety of (usually American) food served in an environment gleaming with stainless steel and vivid colors joined with gaudy art deco patterns and 50s-60s memorabilia. Here, chrome is king, Formica is fashionable, and retro rules. 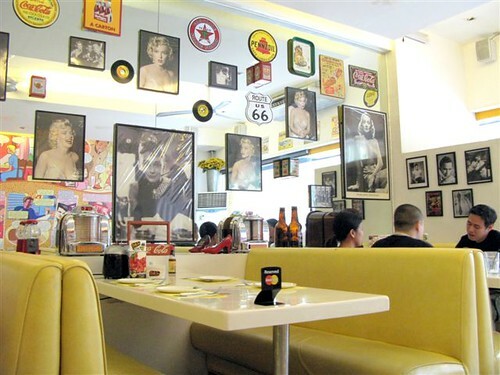 In Manila, this American cultural institution is captured in the likes of Gram’s Diner, Filling Station, and now, Butter Diner. Unsurprisingly, the (ahem) butter-yellow spot standing where Fiesta Carnival once stood, fits very well into the diverse fabric that is Cubao. Diners are called “greasy spoons” probably because of their pervasive smell of grease. Butter Diner is no exception, and while it makes my nose wrinkle at first, I eventually get used to it. The yellow booths remind me of ”“ what else? 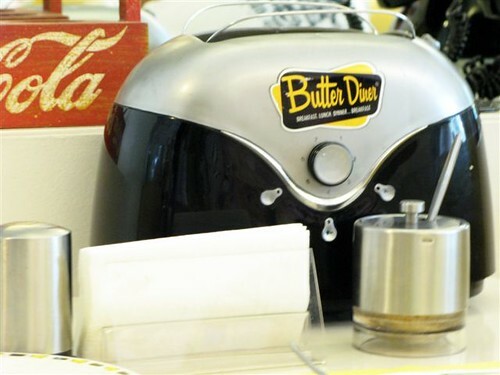 butter — and the vintage pop-up toasters on every table up the vintage appeal of the place. There’s also an entire wall dedicated to cartoon strips that supposedly detail the conception of Butter Diner but frankly, I’m paying more attention to the food. The only thing that confuses me about the décor is the life-size photo on the back wall of a certain Chef Jeff Allen, an American with piercing blue eyes smiling down at me. Since it faces the entrance, it’s the first thing I see and it bewilders since I know that Chef Melissa Sison (of the former Salumeria and MYLK) owns Butter Diner. Anyway. Servers here sport big wigs, although there’s usually the deviant. When asked why he’s “wig-less,” a male server replies in mock exasperation, “Masyadong maiinit, ma’am!” Meantime, his female colleague, who dons a strawberry-blonde afro, hands me the menu. It’s a compact statement of the food served here: the requisite breakfast food, a selection of burgers that differ in sauces, a hotdog with “Everything On It”, and sundry tummy-fillers such as spareribs, calamari, and fish ”˜n’ chips. Of course it goes without saying that the flavored butters are a must-try, since they’re the reason for this diner’s being. 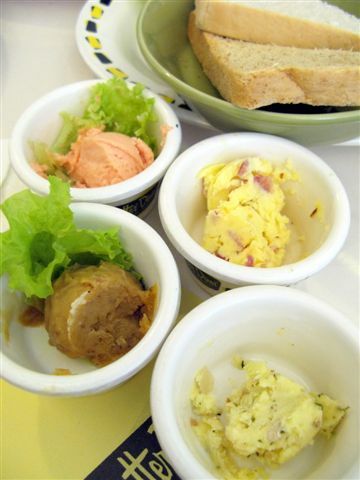 Over 25 flavors of whipped butter (P15 each) are available: my Bin and I choose the Ham & Cheese, Crispy Garlic, Peanut Butter, and the bestselling Famous Strawberry Butter. Along with the Belgian Waffle (P102) and Banana Nut Pancakes (P115) ordered, my Bin asks for a basket of toast; we’re eager to try out the toaster. Ah, the toaster. That vintage pop-up piece of memorabilia that sits on every table just waiting to be used. First, make sure that it’s plugged in — ours wasn’t ”“ making us wonder why our toast was taking too long. Secondly, make sure the settings are to where you want them to be. Our toaster was set to a scorching “6” by the previous customers, thereby rendering our toast a lot more “well-done” than we’d like. The toasts are thick and sometimes don’t fit into the toaster, but it’s good quality brown and white bread, wholesome and filling, and even better with the butter, naturally. My Bin and Boo don’t share my predilection for sweet breakfasts so they share a Pork Tocino (P135) which comes complete with a vinegar dipping sauce, a tomato-lettuce garnish, and one of those fruit salads that I abhor but which my Bin lives for. I’m quite happy with the Banana Nut Pancakes, though they’re not to the level that I expect from a diner. Pleasingly toothsome with manageable chunks of banana and bespattered with cashew bits, the pancakes are made from a batter that’s a tad too sweet, and the pancakes themselves aren’t as fluffy nor as tender as those from say, Pancake House or even Gram’s Diner, my benchmark for truly exceptional pancakes. It’s the Belgian Waffle however that I find much to complain about. It’s tough and gummy, reminiscent of something that’s been reheated one too many times. I refuse to think that the cook was overly enthusiastic with his beating of the waffle batter, thus this irksome waffle that’s onerous to chew. My Banana Milkshake (P99) is a salve to my slackened jaw, its chilly but not overly thick substance a vehicle for the banana bits that are small enough to be sucked up through the straw. Boo’s White Cow (P99), a creatively named vanilla milkshake, is also good, though (again) it’s not as thick as I like my milkshakes to be. Next time, I want to try the Rootbeer Float (P85), that old high school fave of mine dished out when A&W was still around. I sit there mixing and matching flavored butters and alternating between waffle and pancakes. I love breakfast and I’d eat breakfast for lunch and dinner too if I could. My Bin looks over the detritus of a breakfast that’s being eaten with zeal and proclaims, “There’s too much sweet here, I need to order something savory.” Alas, the table tent that proudly announces “Calamari!” is put to shame ”“ there’s no squid in stock. Another wig-less server timidly apologizes and invites us to come back in March when their expanded menu will be introduced. 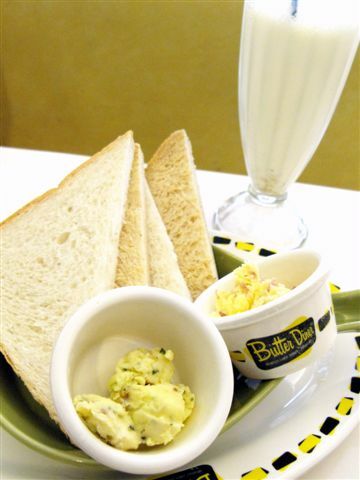 Butter Diner’s flavored butters aren’t an earth-opening, sky-falling taste experience. Really, it’s just whipped butter with the inclusion of various flavors meant to be an accompaniment to the dishes. If you assume that frame of mind, you might be gently surprised at how a little butter makes everything better. I have high hopes for Butter Diner. A place that shouts out, “Breakfast, Lunch, Dinner… Breakfast” on their plates is a place destined for greatness, in my book. 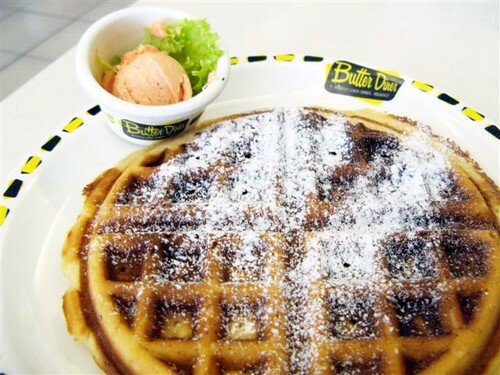 And goodness knows Manila needs more breakfast places to please breakfast fans like myself. It’s heartening to see Chef Melissa Sison at the helm of a restaurant that serves food straight up without any explanation necessary. It’s a stark departure from her two previous outlets that were paeans to new age haute cuisine. i’ve always passed by butter diner and figured im not pulled to go inside enough because i think it’s just a usual eating place with a novelty name. but anyway since you’ve graciously shared the menu here, i still want to try it out, chewy belgian waffle notwithstanding 🙂 and i am a big breakfast person also, so maybe it’s still an addition to my roster of restos. I absolutely agree that everything’s better with butter! And like you, I can eat sweet, carbo-rich breakfast food any time of the day (and since I wake up so late, that’s really what happens, by default). So you can imagine how excited I was the first time I laid eyes on Butter Diner. I couldn’t wait to try it! When I finally got to go there, I was charmed by the cheery interior and the retro decor; I couldn’t stop taking pictures. And it was a real battle not to try every single flavor of butter…I managed to limit myself to four. But sadly, everything we ordered was so-so. Most disappointing for me was that the butter — their showpiece — was crumbly and bland. I was actually willing to give them a second chance one day, and when I saw you’d written about them, I thought that maybe they’ve improved now. But it seems you weren’t very impressed, either. It’s such a shame, really, because conceptually, Butter Diner could’ve been one of my favorites. Despite how far away it is from me, I would’ve found reason to go often, if only the food were worth it. Sayang. The “history” on the wall and Jeff Allen’s photo confused me, too. 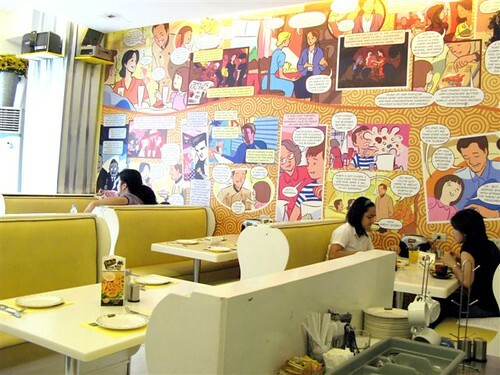 Could it be that Butter Diner is a foreign franchise owned by Melissa Sison? Also, when I was there last year, the menu had just been changed — I think they’d removed some diner staples and replaced them with more Pinoy-friendly fare. I hope when they revise the menu again in March, they won’t move even further away from their concept, or what would be the point? Robyn just had her first taste of filipino dishes. She’s raving about the crispy pata! Your header changes — that’s soooo cool!!!! I wasn’t impressed by Butter Diner either… I got that grimy, sticky, not-too-clean feeling when I dined there. tried butter diner but was, like you, sadly underwhelmed. i agree with your assessment, though, that manila could do with more diners. 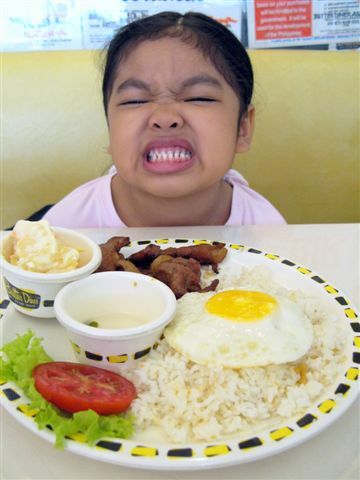 i was sad to see DC diner–the nearest one to my home in QC–close down. good diner food needs to be of a quality that screams that it was prepared with love, and so far butter diner just hasn’t lived up to its potential. Also, THank GOD they finally got rid of all those wigs!